Also known as ChocChipXChocolate Cookies or Chocolate2 Chip Cookies. See what I did there? With an electric beater (i.e. Proctor Silex 5-Speed Hand Mixer) in a separate bowl, beat butter and both sugars until smooth. Add one of the eggs and continue to beat until completely incorporated. Add second egg and vanilla extract until blended. 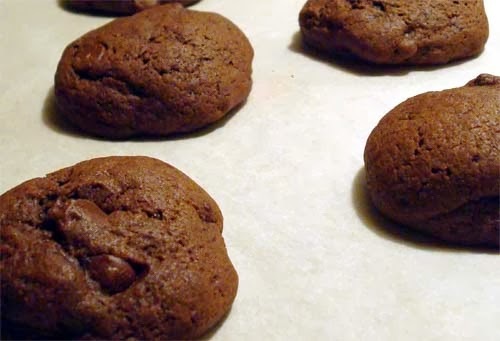 Add in the dry mix of flour, cocoa powder, baking soda and salt until well blended dough forms. 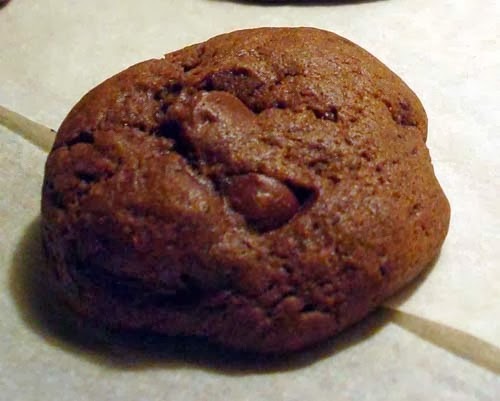 Add chocolate chips and fold to uniformly mix. Scoop a heap of teaspoonfuls onto ungreased parchment paper. Bake until edges are slightly darkened without burning. Should take 10-15 minutes depending on oven.